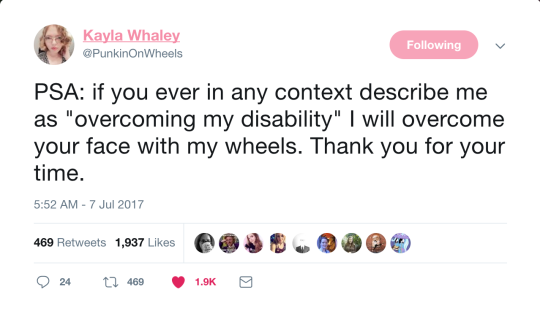 A tweet by Kayla Whaley that says PSA: if you ever in any context describe me as ‘overcoming my disability’ I will overcome your face with my wheels. Thank you for your time. I absolutely love this tweet. I too have experienced this kind of treatment in both my brief stint as a wheelchair basketball player and in my current career as a software engineer. The thing that really amazed me the most about this tweet, however, were some of the responses. Most of them were positive but some people reacted to this tweet with a kind of defensiveness; shocked that their compliment could be taken as an insult. One person went so far as to encourage here to overcome her bigotry . What? Wow, Urban. This new UI you put together is great. You really didn’t let your wheelchair get in the way of this. Great work . Man, Urban not only made this algorithm 30% faster, he did so despite being in a wheelchair . Starting to see the picture now? When you couch everything we do within the context of our disability, it obscures and diminishes the true nature and value of our accomplishments.